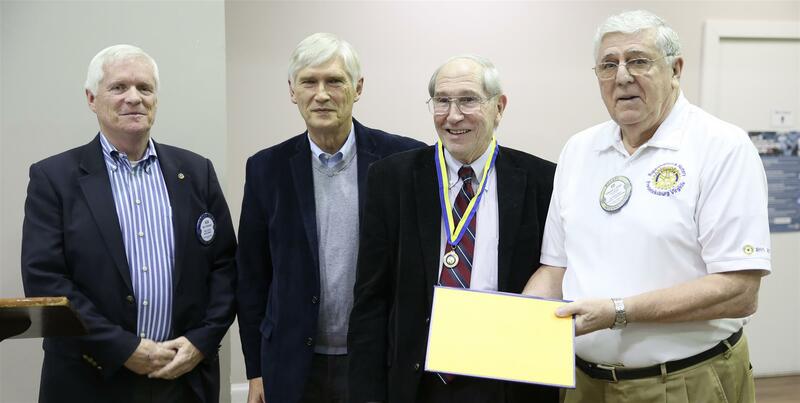 The Rappahannock-Fredericksburg Rotary Club's 2018-2019 Citizen of the Year Award is presented to Jack Rowley, a long-time volunteer and community leader in the Fredericksburg area. This Award is given in recognition of a non-Rotarian who exemplifies “Service Above Self” in his/her personal and professional life. A retired business executive, Rowley has volunteered since the 1990s with numerous nonprofit and government organizations—including Mary Washington Healthcare, Rappahannock United Way, Rappahannock Area Community Services Board, the Stafford County Economic Development Authority and the Rappahannock Council Against Sexual Assault. He also serves on the Germanna Community College Educational Foundation board and played an integral part in making the school’s Stafford campus a reality. Bruce Davis, who worked closely with Jack on the Germanna expansion, said: "Jack is so deserving of your club's honor, as everyone knows Jack is busier in retirement than when he worked!" Rowley is now eligible for the Rotary District 7610 Citizen of the Year Award, the winner of which will be announced in July 2019.